These U.S. flags are made of tough 2 ply polyester with an extra rugged weave to provide long lasting beauty. It is the strongest, longest lasting flag material, which was developed for maximum durability in unpredictable weather conditions. 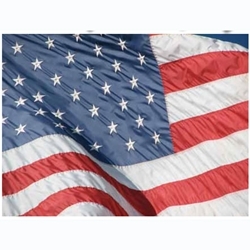 Polyester American flags outlast nylon American flags and are an excellent choice for high wind areas. Sizes 3' x 5' through 6' x 10' have brass grommets. Larger sizes have roped headers with galvanized metal thimbles. Use the drop down box to view the low prices on our huge selection of flag sizes!